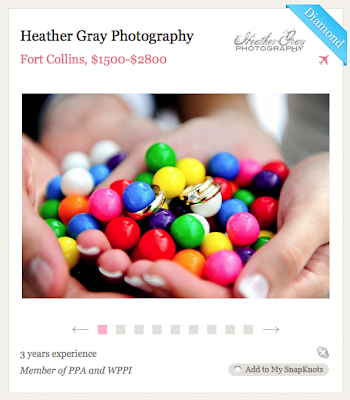 Heather Gray Photography: Picking your perfect Wedding Photographer. Picking your perfect Wedding Photographer. When looking for a wedding photographer it is important to find someone that jives with you and your soon-to-be. I recommend looking at a handful photographers, interviewing them and being very selective. As a wedding photographer, I know that we get backstage passes to one of the most important events of your life, so would you want someone that not only produces beautiful images but all makes you feeling amazing and gets a long with you, your friends and family. For my wedding I had an amazing photographer (Mike Larson) who is not only incredibly talented with a camera but also an amazing person. He is the kind of person we would grab a drink with or invite him to our house for dinner. He is that awesome and we have since remained friends. He went above and beyond our expectations and even removed red wine (yikes!) from my silk wedding dress after a guest spilled on me. This is the kind of photographer I strive to be with my clients. I want you to be worry free, focus on the real meaning of your day, feel amazing and have a great time celebrating your love with your friends and family. In your search for photographers, please check out SnapKnot. I love how simple and easy their site is. You can search for wedding photographers by city and then by price. We are featured as a "diamond" member and super stoked to be included in such a cool site with so many talented peers. Please stop by and say hello. There are a ton of rockin photographers with beautifully compelling photos and some fun ones too. I hope this helps you on your search for your perfect wedding photographer.